Pelosi initially invited Trump to deliver the traditional address on January 29. In the increasingly personal standoff between President Donald Trump and House Speaker Nancy Pelosi, the president on Thursday announced he had postponed Pelosi's official trip to Belgium and Afghanistan – cutting off her access to military aircraft – in apparent retaliation for Pelosi asking Trump to delay his State of the Union Address until after the government shutdown ends. 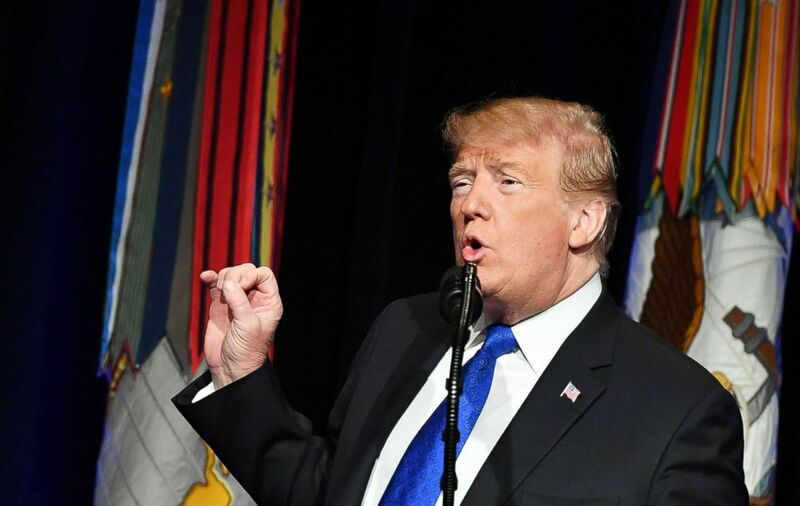 (Mandel Ngan/AFP/Getty Images) President Donald Trump speaks during the Missile Defense Review announcement at the Pentagon in Washington, DC, Jan. 17, 2019. “The purpose of the trip was to express appreciation and thanks to our men and women in uniform for their service and dedication, and to obtain critical national security and intelligence briefings from those on the front lines,” Hammill said, adding that Trump traveled to Iraq, and New York Republican Rep. Lee Zeldin also led a congressional delegation to Iraq during the shutdown. “We’re not going to allow the President of the United States to tell the Congress it can’t fulfill its oversight responsibilities, it can’t ensure that our troops have what they need whether our government is open or closed," Schiff told reporters after huddling with Pelosi in the speaker’s office. Schiff refused to say whether Pelosi would still make the trip and blasted the president for divulging the speaker’s travel plans. She said Pelosi and Senate Minority Leader Chuck Schumer “always have an invitation” to the White House if they want to come to negotiate. “One sophomoric response does not deserve another. Speaker Pelosi’s threat to cancel the State of the Union is very irresponsible and blatantly political. President Trump denying Speaker Pelosi military travel to visit our troops in Afghanistan, our allies in Egypt and NATO is also inappropriate," Graham said. Pelosi predicted there's “bipartisan agreement” to use other technology to protect the border, but stressed “I'm not for a wall,” when she was asked why she hasn’t proposed an alternative dollar figure to counter the president’s $5.7 billion demand for a barrier.